I missed the memo about bagels. Growing up in a pretty WASPy corner of the South, I think I was in my teen years before I even knew what a bagel was. Judging by its round shape, the hole in the middle, and the time of day at which it was served, I was expecting something like a donut. I was bitterly disappointed. Because I was expecting sweet and airy and I got dense and chewy, I resented the bagel for not being what I expected it to be. Since then, I’ve come to my senses. Bagels are awesome. Toasted, untoasted, embellished or plain, or purely as a delivery system for cream cheese. Yum. It might seem kind of banal to be ruminating about bagels, but that first experience has always stuck with me. It still strikes me as funny (both “ha ha” and weird) that instead of appreciating the bagel for what it was, I was disappointed because it wasn’t what I thought it would be. I think I remember the bagel incident because it was just so silly, but I wonder how often I make these misjudgments when the stakes are higher? What I’m getting at here is that expectations can be a bit of a trap, so I need to tread carefully to avoid being ensnared. I like to plan, I like to have expectations, but my expectations can trick me into needlessly feeling disappointment. Example…I remember seeing the rough cut of my wedding video and there’s a shot of me waiting to go down the aisle and I am clearly seen making an angry face and saying a word unbefitting a bride simply because my aisle runner hadn’t been laid out the way I expected. So stupid to let a little deviation from my expectations take me out of the happiness of the day. 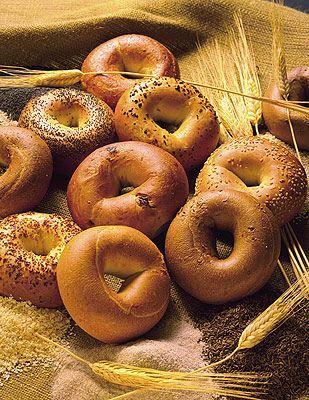 As donuts go, bagels are terrible, but as bagels, they’re outstanding. Sometimes, letting go of expectations is the key to happiness in both life and in brunch. I’ll have this memo with a schmear of cream cheese, tomatoes, and turkey bacon please. Memo received. I too love the cream cheese, tomatoe and turkey bacon combo. Your sis finds it totally disgusting. I’m so tickled you’re reading, Susu! When I was pregnant, I could easily eat two huge bagel sandwiches every morning! Now I try to be moderate and use bagel thins and low fat cream cheese. And my sister doesn’t know what she is missing!